Volvo (Gothenburg / Sweden; www.volvocars.com) has announced that from 2025 at least 25% of the plastics used in every newly launched Volvo car will be made from recycled material. 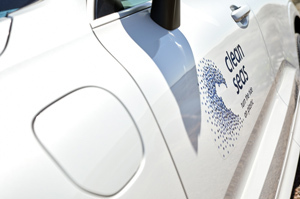 The company, which made the commitment at the âOcean Summitâ in Gothenburg on 18 June 2018, urged auto industry suppliers to work more closely with car makers to develop next generation components that are as sustainable as possible, especially with regards to the increased use of recycled plastics. The announcement comes a month after Volvo committed to eradicate single-use plastics across all its premises and events by the end of 2019. To demonstrate the viability of its 25% recycled-content goal, the company has developed a specially-built version of its âXC60â T8 plug-in hybrid SUV that looks identical to the existing model but has had several of its plastic components replaced with equivalents containing recycled materials. For example, the interior has a tunnel console made from renewable fibres and plastics from discarded fishing nets and maritime ropes, the carpet contains fibres made from PET bottles and a recycled cotton mix from clothing manufacturersâ offcuts and the seats also use PET fibres from plastic bottles â" watch Volvo's video on XC60 T8 here. Martina Buchhauser, senior VP of global procurement at Volvo, said that to achieve the new goal, the availability of recycled plastics needs to increase. âThat is why we call on even more suppliers and new partners to join us in investing in recycled plastics and to help us realise our ambition,â she added. Volvo said that raising the recycled content of its cars is part of its commitment towards reducing its impact on the environment. Last year, the company announced plans to electrify all new Volvo cars launched after 2019. This was followed by the announcement last month that it aims for fully electric cars to make up 50% of its global sales by 2025.